Introduction: At TT we support all different types of methods of taking big game fish. 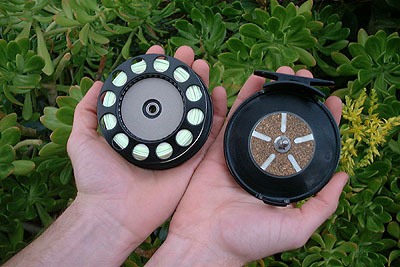 If Fly-Fishing is your niche, then here�s our first in depth look at a fly-reel. There is nothing quite like bringing in trophy fish on a fly-rod and if you have done it before then you know exactly what I�m talking about. When I first looked at fishing with a large arbor reel I didn�t really know what to expect, but after using the Bauer M3, I can tell you that this reel is second to none. Impressions: My first impression of the Bauer M3 reel was that it was big and maybe a little bulky, but after using it I can tell you that using a large arbor reel for big game fish has many advantages over conventional reels. With a MSRP of $330, many fishing enthusiasts will not be attracted to the price, however if you must have the best tackle on the market the Bauer reel is an option that you just cannot overlook. 1) It allows for quick line retrieval that comes in handy when having to reel in fast as a fish in running back at you. 2) Also provides consistent drag pressure that is consistent whether you have a little bit of line in the water, or are deep into your backing. The Real World Test: I have had the pleasure to test this reel primarily on big waters such as the Lower Sacramento River and Feather River. The large arbor allows for quick line retrieval, and a line carrying capacity that conventional reels just can�t match up to. The result is a better hook-up to land ratio. After all, it�s not how many fish you hook into; it�s how many make it into the net. The Weight of this reel is very deceiving when looking at its size. At 6.8 ounces it balances perfectly on a 7 or 8 weight rod. I immediately noticed that managing your line while a fish is running is much easier on a large arbor reel like the Bauer M3. If you have the cash to fork over you can immediately expect to be releasing more fish consistently. 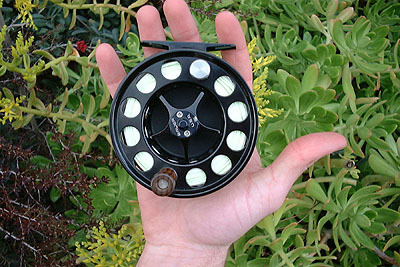 Tightening or loosening the drag is a cinch with the same side drag dial of this reel. You can actually tighten or loosen the drag with one finger on the 5 star knob. 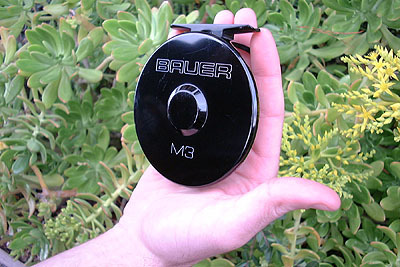 The Bauer M3 has been a problem free, hassle free, piece of equipment every single time I have used it. Conclusion: If your fishing for trophy fish, the Bauer reel should be a top priority in your decision set. The fact that Bauer offers a lifetime warranty gives an indication that they expect this reel to last as long as you do. Outfitted with premium features all the way around, the Bauer M3 proves to be at the top of it�s class. When I used this reel I immediately noticed that I started landing more fish. The large arbor gives you a greater margin of error for keeping the line taught especially when the fish is streaking back towards you. 3 rotations of the handle and you just reeled in over 2 feet of line, no matter how far into your baking you are. Put the Bauer M3 on any 7 or 8 weight rod and you just increased your chances of landing that trophy. Try it and you�ll know exactly what I mean.